That’s right. No bowl required. 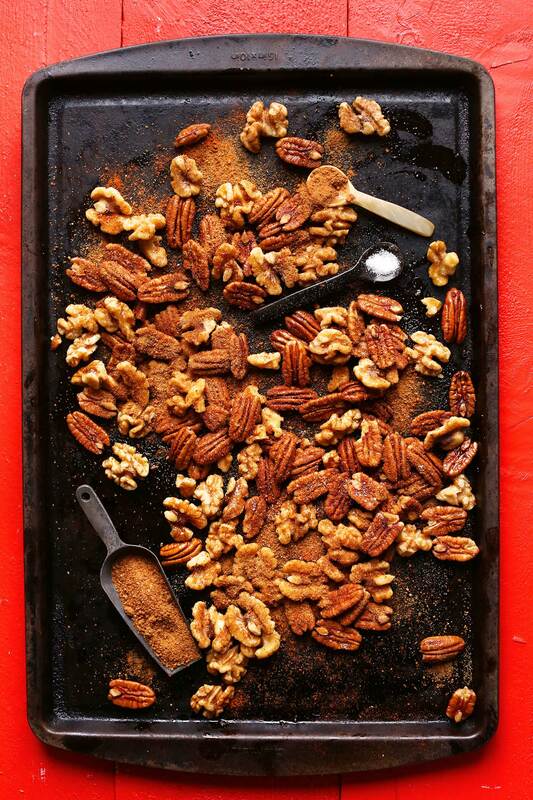 Just dump walnuts and pecans onto a baking sheet, season, roast for 12-15 minutes, and BAM. You have roasty, toasty, delectable gifts or snacks. Wasn’t that simple? These nuts truly are so easy they’ve become my go-to last-minute snack, salad– and oatmeal-topper, and gift (of course). Keep them all for yourself or double the recipe and portion out into jars wrapped with twine and a little gift tag. Awe, isn’t that cute? And festive? Yeah, it totally is. We hope you give this recipe a try. If you do, let us know by leaving a comment, rating it, and tagging a photo #minimalistbaker on Instagram! We’d love to see what you come up with. Cheers, friends! 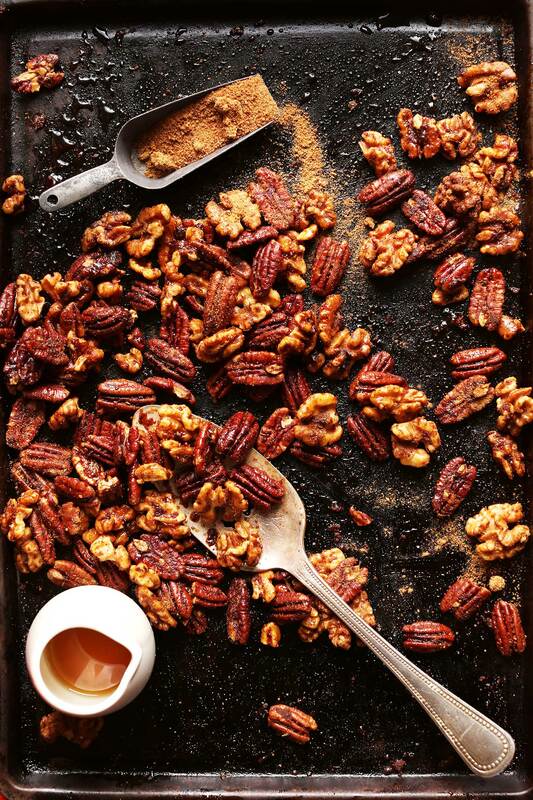 Amazing 15-minute roasted candied nuts made all on 1 pan! No bowl required, so spicy-sweet. The perfect holiday snack or homemade gift! 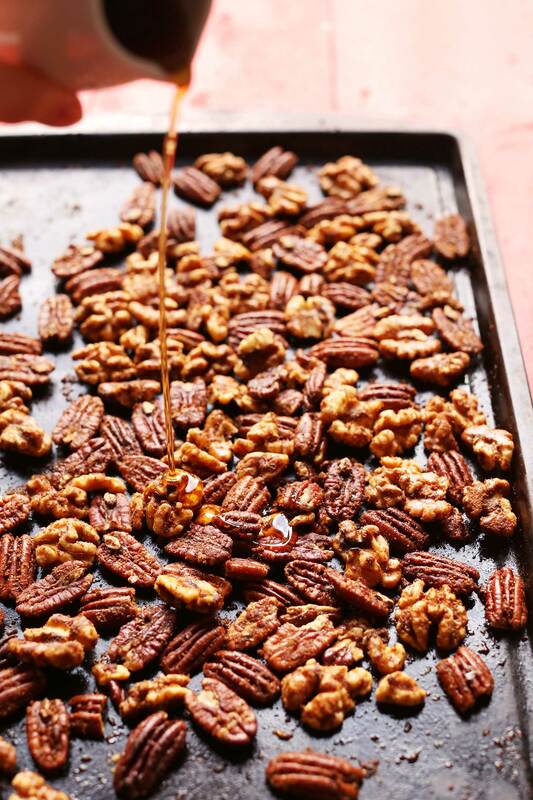 Add pecans and walnuts to a bare (or parchment-lined) baking sheet (or more baking sheets if increasing batch size) and top with oil, coconut sugar, cinnamon, cayenne, nutmeg, salt, and half of the maple syrup (1 Tbsp as original recipe is written // adjust if altering batch size). Toss to coat. Bake for a total of 12-15 minutes, or until golden brown and fragrant, tossing/stirring once at the halfway point to ensure even cooking. Then remove from oven and immediately drizzle with remaining maple syrup (1 Tbsp as original recipe is written // adjust if altering batch size). I also like to sprinkle on a little more salt, cinnamon, and coconut sugar to coat, but this is optional. Stir to combine/coat and enjoy warm or let dry/cool completely on the pan (they'll crisp up as they dry/cool) before storing in an airtight container at room temperature up to 2-3 weeks (or in the freezer up to 1 month). These make an excellent snack or topper for things like smoothies, salads, oats, baked oatmeal, pancakes, and roasted sweet potatoes. They also make a lovely gift! Portion into small jars, tie with ribbon or twine, and give the gift of plant-based goodness. *Recipe (as originally written) yields 2 cups total. I have never commented on a recipe, but I felt compelled to share with you the INCREDIBLE results of this simple recipe ! I have made perhaps 10 batches of this already, and I eat them as snacks, or add them to salads, or to homemade dark chocolate. I personally skipped the entire sugar step, and used only the recommended amount of maple syrup, and it was a perfect amount of sweetness for me personally. Either way, I keep justifying that this is good for me, because I eat way too much of this! So good ! Thanks ! 10 star recipe at my house! We were gifted a HUGE amount of pecans and once I found this recipe, I ran with it. Doubled it every time and made it THREE TIMES over the holidays: once for gifts, once for my in laws, and once for a birthday party. Huge hit every time and twice was asked for the recipe (I directed them here of course). I added cashews to the mix (on hand and I love them). Mixed in a bowl rather than the pan (just my preference) and added a little of the sugar/spice mixture after they came out and were treated with more maple syrup. LOVE this and will be making it forever! Thank you! We’re so glad to hear that, Jenny! will try your way for sure!! I tripled this batch and my nuts burned after 8 minutes. This was so disappointing because your recipes have never steered me wrong and I wasted about $50 worth of nuts. It’s sad cause I literally thought ‘oh I can’t go wrong with a MB recipe!’ Too much maple syrup or oil I imagine. They were quite soaked. These are so delicious! I made them for my son’s teachers as gifts but I’m not sure they will get to them! I subbed in pistachios for pecans for one portion because I ran out. Still tasted amazing. I might try another batch with almonds and pretzels and mix it with other batches. This recipe is so versatile. Thank you for posting!! I used raw hazelnuts that were strained out from a batch of homemade hazelnut liqueur. They were AMAZING in this recipe! No alcohol taste was left, and the vanilla beans that I used in the liqueur left a subtle note in the hazelnuts as well. Delicious! Do you soak your nuts first? They are supposed to be healthier that way…. to reduce the the digestion inhibiting phytic acid. Curious if it would work to leave out the coconut sugar/sugar all together since using maple syrup adds sweetness? Thx! you could, but the result just won’t be as sweet! I’ve made this three times now. First time as in the recipe. Second and third time substituting yacon syrup for sugar and maple. Always made with the intention of serving at the end of a dinner party, but the nuts have never made it to the table – they always get eaten before the event! Does it matter if unrefined or refined coconut oil is used? What’s a good substitute for maple syrup? I’m Canadian so it’s weirs for me to ask (hehe) but I live in Spain. Honey maybe? These haven’t even made it to the oven yet and I’m already in love! I could drink that spice/oil/syrup mixture. Thank you on behalf of my lucky family who will be receiving this awesome treat! Also- love the format of your comments section and that you’re able to easily pinpoint comments from people who’ve tried the recipe- super useful! I used chili as I didn’t have cayenne, and yacón syrup instead of maple. Very tasty, thank you. I just have a question. Can you make them without oil? And, if so, do you replace it with water? Hmm I’m not totally sure that would work, but if you experiment with it, report back on how it goes! Water would quickly evaporate, and you would risk burning the entire batch! Made these to give out for Christmas, and they got rave reviews! Thank you so much for your recipe. These were wonderful! Simple, quick, and enjoyed by all! Excellent!! When I mixed up the dry ingredients, I made about 50% extra and sprinkled that extra bit on the hot wet nuts when they came out of the oven and stirred to combine. Mine were still a bit moist when they cooled, so I put them in a 250 Fahrenheit oven for another 10 minutes, but watched them carefully so as not to burn them. This recipe is a keeper and I will double it next time! Hi, I made this and they ARE delicious! One problem I had was all the good saucy stuff falling off the nuts and baking onto the surface of the pan. I used coconut oil and coconut sugar. Has this happened to others? Any tips? Thanks! This just happened to me too. I used the metric version of the recipe and substituted hazelnuts but everything else was as written. I feel like I used too much oil, maybe. This happened to me too. Too much sauce, but to be honest I multiplied the recipe and maybe my math was wrong. I also baked them for too long … will have to try it all again! The smell is amazing though! I just fixed these as one of the smaller gifts I’m creating for an adventcalendar! 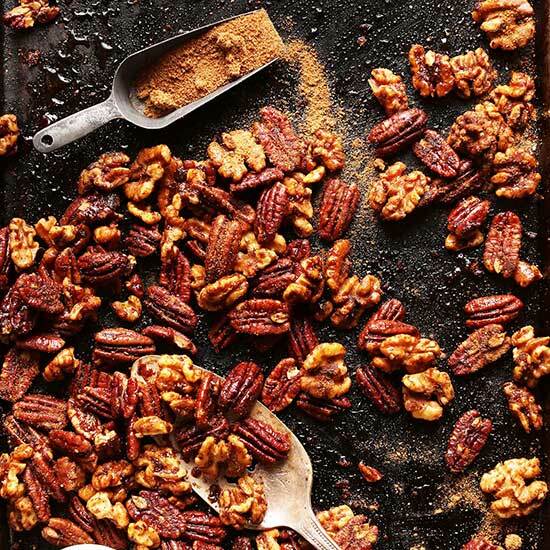 My Dad loves spiced nuts so this is perfect (and inexpensive)! I made half of the amount, set aside 1/4 cup for him and put it in a cute bag but ate the entire rest – Oops! So good and simple (and not overly sweet) – thank you! Yummy! I used all walnuts, but I can’t wait to try pecans, too! Made these as a gift Dana, they looked beautiful and tasted incredible. Than you for this recipe. It will become a Christmas favourtie (well, lets face it, an all year favourite). OhMyGosh! Heavenly! Doubled the recipe, and the pan was too crowded. Next time (I’m totally making these every Christmas) I’ll make two batches. And I won’t touch them immediately after taking them out of the oven. Ouch. And, duh. Thank you Dana! You’re an inspiration.. Happy Holidays! I just made these using almonds instead of walnuts. They are delicious! I even doubled the recipe on my first time making it because I know your recipes are great! Wow! First of all, it’s worth making these just for the smell it brings into your home. I mean I would consider just making this every time I want my house to smell like a home. Second of all, these were so delicious that I barely had any left by the time the pan was fully cooled. AMAZING. I almost went with regular sugar, but happened to walk by coconut sugar when I was in target grabbing pecan/walnut pieces. I’m glad I stuck to the recipe. 5 stars! I haven’t tested it that way. But if you give it a try let me know how it goes! Hi! This looks amazing. What can I use if I don’t get coconut sugar? Any other sugar should do, such as cane or brown sugar. I totally get you! Apart from being all the above, I’m a terrible gift wrapper! Just finished buying everything yesterday, now I have these days left to mess up way too much wrapping paper that I’m supposed to. Merry xmas! Do these end up being kind of sticky from the syrup? I’m wondering if I could make them ahead and put them in jars; would they glue together into a solid block? Can I use white sugar instead of coconut sugar? Hi Dana! These look simply heavenly—I can’t wait to make them for some last minute gifts for family :) Could you give me a general idea of the shelf life of these babies? Yeah! At least a few weeks. I’ve had mine in the pantry for a few weeks and they’re fine. But transfer to the freezer for longer term storage! Plant-based & simple goodness – yes! Can I substitute the coconut sugar for brown or white sugar? I’m wondering this too. One of my kids is allergic to coconut so I’m wondering if I used white or brown sugar, would the amount change? I’ve not used coconut sugar before so I’m not at all familiar with its sweetness? Yes! That should work. Replace it 1:1. I love the cinnamon and cayenne in these roasted gems!! 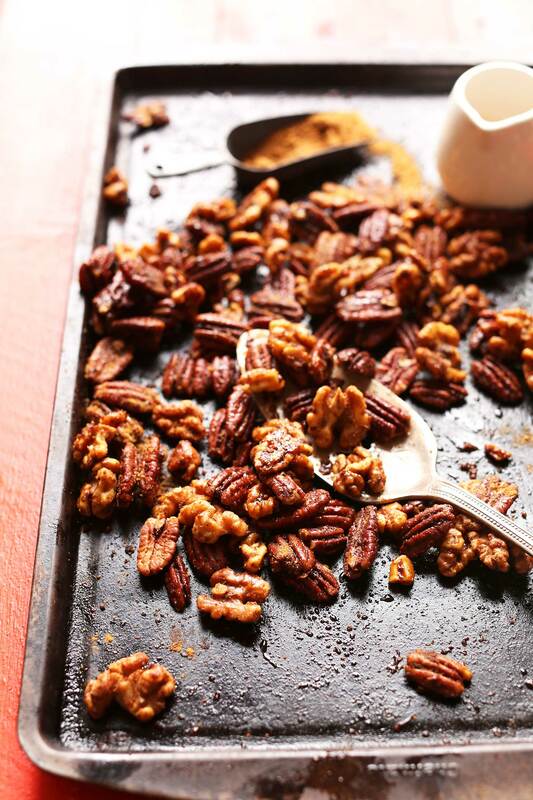 I LOVE spiced nuts and will have to try this recipe! Good one Dana! These look fantastic! Who doesn’t love candied nuts? Could they be done with other choice of nuts? I have a kid that can’t eat walnuts or pecans but can eat everything else. Cashews, almonds, peanuts? Pistachos? What other combination would be good? So, cashews would work, and maybe peanuts. But for some reason I don’t love almonds in this – they don’t tend to hang onto the coating very well. My aunt makes something similar with a tiny bit of rosemary added into the spice mix. Sooo yummy! I love your recipes! Yum these look AMAZING! Also loving that red wood board what a lovely pop of color! This is fabulous because my mom wants to do $10-$15 gift exchanges and mandate that the gift is homemade. So I absolutely love where you are going with the gift idea here. Fabulous. People will love this twine and all. It sure beats all the weird and pricey gifts I got last year. Alligator head? Creepy and weird. Etsy picture of myself as a cartoon Rapunzel? Even creeper. Nuts, delicious and not creepy.